We recently tested the water with ideas for a replacement village name sign at the Calver end of the village, along with a new one (as we don’t have one) for the Eyam side of the village. We had a good response and all seemed in favour, offering varying ideas and preferences. The idea was then raised with Derbyshire County Council who confirmed that subject to varying conditions they would be in favour of new signs. With a green light to the principal we gave much more thought and consideration to the options, opinions received and looked at what other villages had done. As a result we have a new blueprint (one above for Calver end of village) encompassing all the above criteria. We now have permission from the Parish Council, and are awaiting feedback from County Council and the Peak Park as it is different from that already discussed. 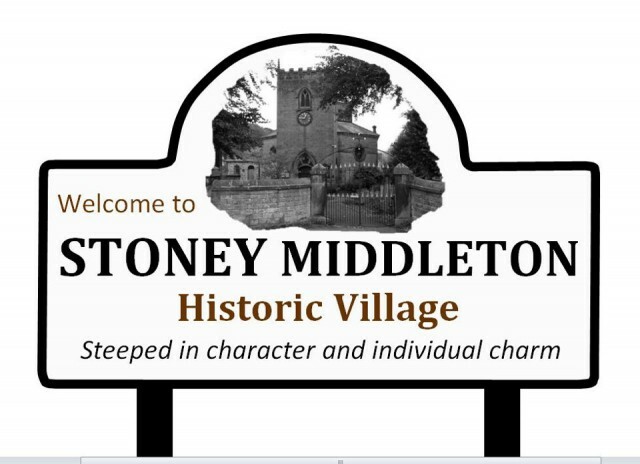 We also have permission from the Mason family for use of the picture for the sign at the Eyam end of the village, (provided to us by Rosmary Lockie), but originally copyright of the late Tony Mason. 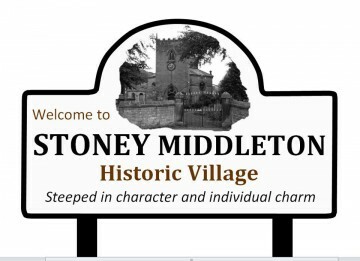 The signs highlight the importance of the village historically, while the strapline summarises the special character and charm of the village. The ‘Welcome to’ indicates the friendliness and welcome which a visitor might receive. The picture for the sign at the Eyam end of the village, shows workers in Goddards Quarry, along with the surrounding stones (possible cart) which connects the village to its principal past of mining and quarrying. This landscaped area around the signs (if allowed) would need some maintenance as it could be counterproductive if left unattended, it would therefore be helpful to know if anyone (or group) would be interested in helping to maintain them.